Facebook Inc. is launching a new feature that lets users notify friends and family with a single click that they are safe during or after natural disasters. The tool, called "Safety Check," will be available worldwide to the social network's 1.32 billion users on computers and mobile devices. This includes both smartphones and the basic "feature" phones many people still use to access Facebook, especially in developing countries. People already use Facebook to post updates about how they're doing after an earthquake or other disaster, but Facebook says the Safety Check tool will make it easier. It grew out of a disaster message board that Facebook engineers created in 2011 following the earthquake and tsunami in Japan. Once users activate the tool, it will determine their location using the city they have listed in their profile, the last location they've shared or the city where they are using the Internet. Then if a natural disaster occurs in that area, Safety Check will automatically send them a notification asking if they're safe. If they click "Yes," their Facebook friends will be notified. There's no option to say no. Users can also mark their friends as safe, but the friends have to approve it. 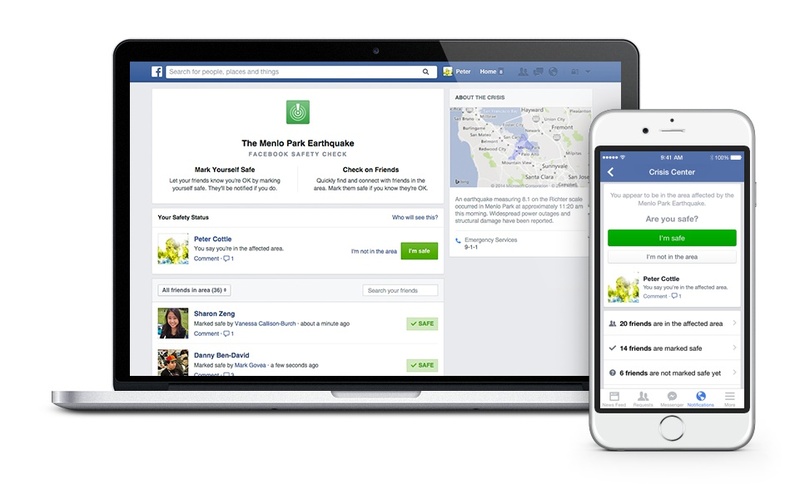 Facebook users will receive notifications of any friends in the disaster area of a natural disaster who have activated the took and marked themselves as safe.